At the Mutant Dinosaur Park, a friendly hello or an excited call only gathers confused stares from the dinosaurs... Upon arriving at the park, you may use their own “language”. Only imitating their sounds can grant you entrance and success - no words allowed! 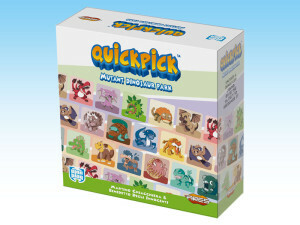 Quickpick - Mutant Dinosaur Park is the second release in the Quickpick line, coming late this month. Created by the Italian game designers Martino Chiacchiera and Benedetto degli Innocenti, it's published in English by Ares, under license from chinese company PlanPlay. Like its predecessor, Quickpick – Island of Monster Masks, this is a fast action game that rewards both ingenious and creative players as well as nimble-fingered, quick thinking ones. The innovative gameplay is based in the ability of choosing and taking actions quickly, using different perception skills, such as recognition of expressions and sounds. Mutant Dinosaur Park, the new Quickpick game. While in the Island of Monster Masks, the challenge is to mime the Monster shown in a card - or guess which Monster is being acted out - in Mutant Dinosaur Park players arrive at a park of mutant dinosaurs to find that they must imitate the roars of the creatures to communicate with them. At the start of the game, players arrange the Dinosaur Tiles in the center of the table, and players take turns drawing Dinosaur Sound Cards and then imagine and perform the roar of their randomly drawn creature. The other players must guess the dinosaur that he is acting out, and if a player guesses correctly they get to collect a Dinosaur Sound Card. 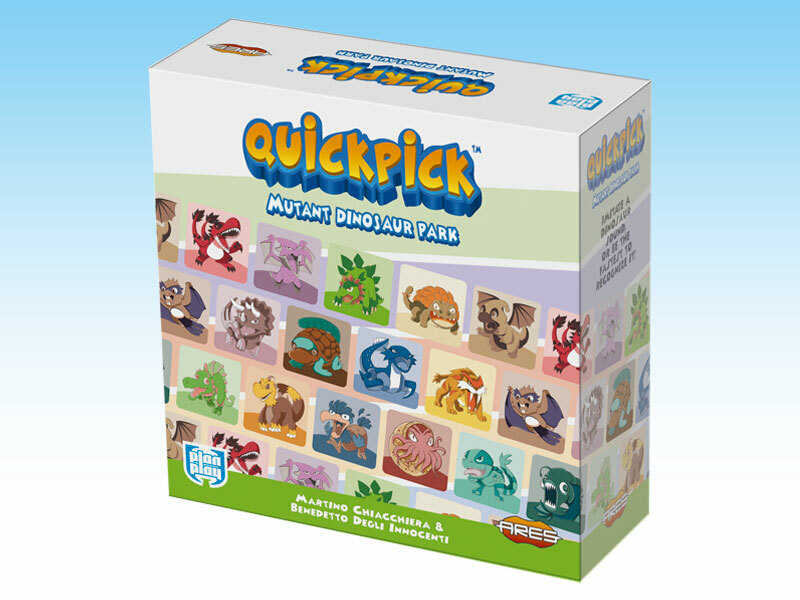 To succeed in the Mutant Dinosaur Park, players must combine visual understanding, dexterity, and instantaneous action mechanics to imagine the growls of the creatures and effectively guess their competitor’s roars. The player with the most Dinosaur Sound Cards at the end of the game is the winner. 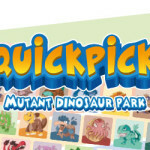 Quickpick - Mutant Dinosaur Park is suited for 3 to 8 players, age 4 and up. The rules are available online - to read and download the rulebook, click here.